A Florentine studio where Renaissance finishes meet contemporary design. Here I am again in Florence making lots of visits to my friend Alison's studio, on the top floor of a vintage stone palazzo filled with light and packed with samples, gilding tools, pigments, painted furniture, and at least two harpsichords-in-progress. 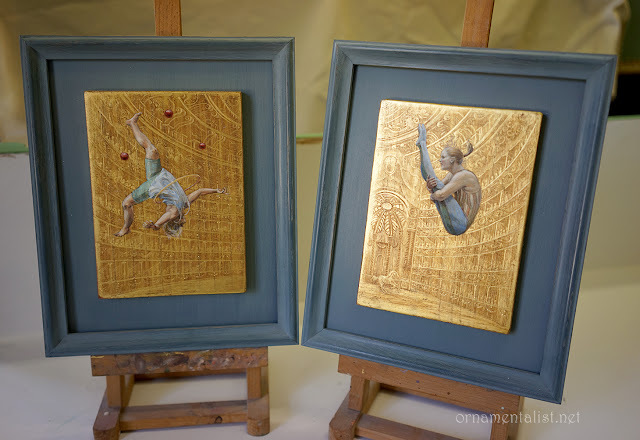 Long known for her gilding work, traditional harpsichord decoration, and distinctive Florentine painted furniture, Alison Woolley has in recent years been expanding more into contemporary design. "I love nice craftsmanship and design and it doesn't matter what period," Alison tells me. "I do enjoy clean lines and I love that about the mid-century modern. Florentine Renaissance style often has clean lines, lovely large proportions, and very rich surfaces." The juxtaposition is a harmonious one for an aesthetic shared across 600 years. 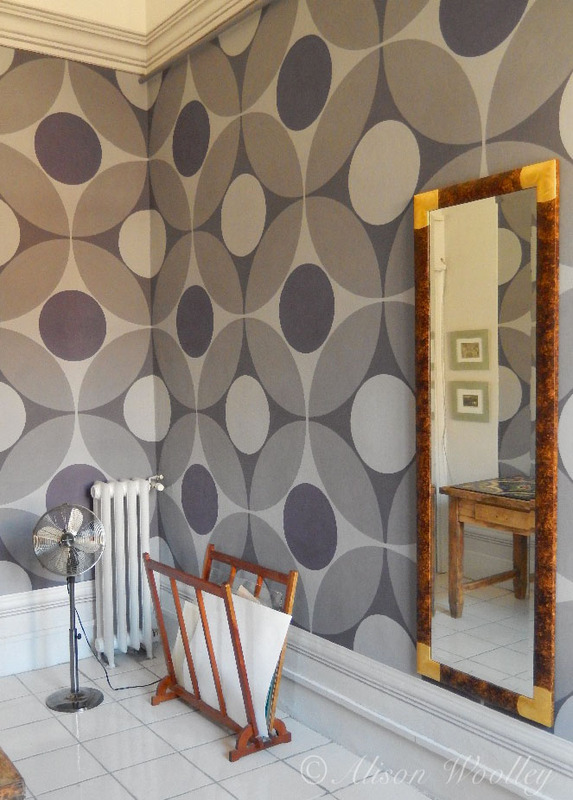 In the design office of Alison's studio, an Art Deco style mirror hangs on hand-painted walls inspired by 1970s wallpaper designs. The bold scale of the pattern is surprisingly effective. "The different values of the circles create a feeling of space so the pattern on the walls has made the room feel more spacious than it did before when the walls were white. I have a carefully chosen colour scheme that ties everything together." 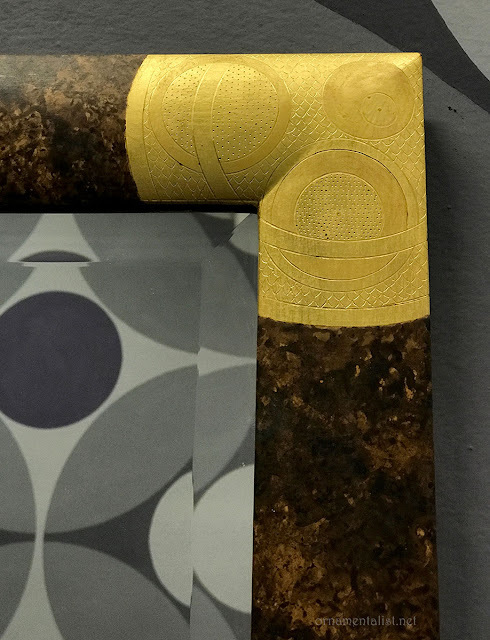 Gilded Art Deco detail in a faux tortoise mirror frame by Alison Woolley. 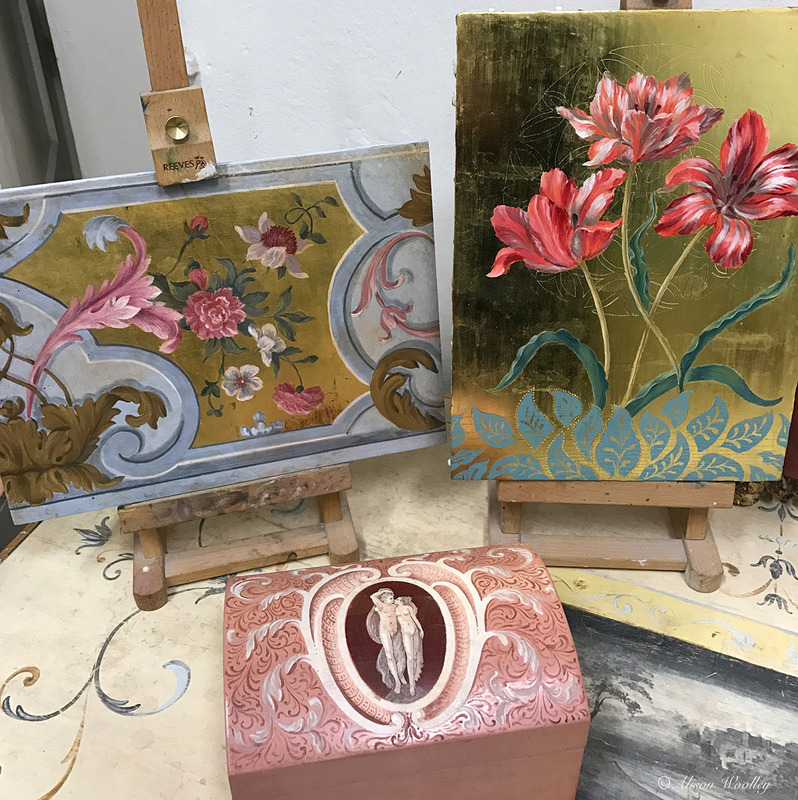 A native of Toronto, Canada, Alison moved to Florence in the late 1980s, and worked for 15 years under the guidance of Florentine master artisans, prior to opening her own bottega in the heart of the artisan district. 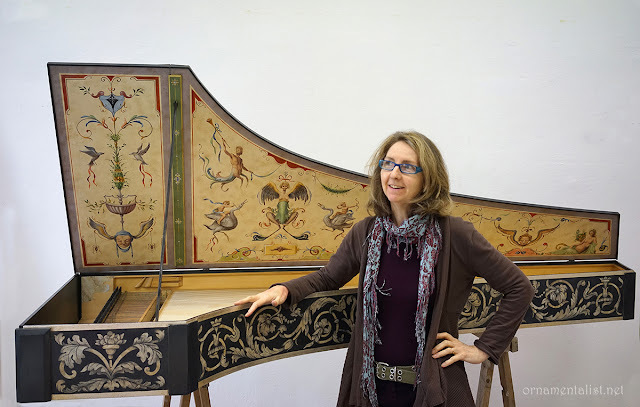 A specialist in harpsichord decoration, Alison uses historic materials and techniques for this exacting work, which she in turn applies to furniture, textile designs, and artwork. 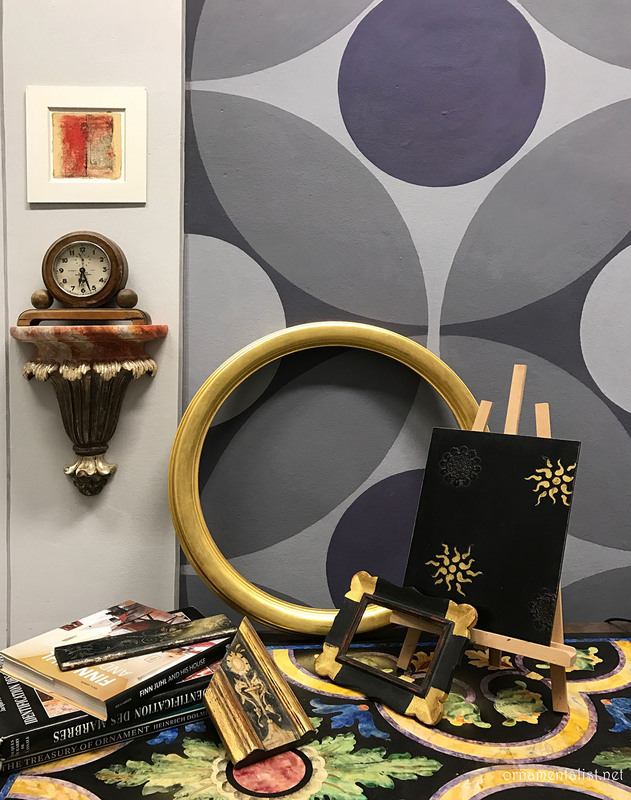 Recently she has designed custom Italian Stencils for California-based company Royal Design Studio, as well as scarf designs for the Italian fashion house Salvatore Ferragamo. 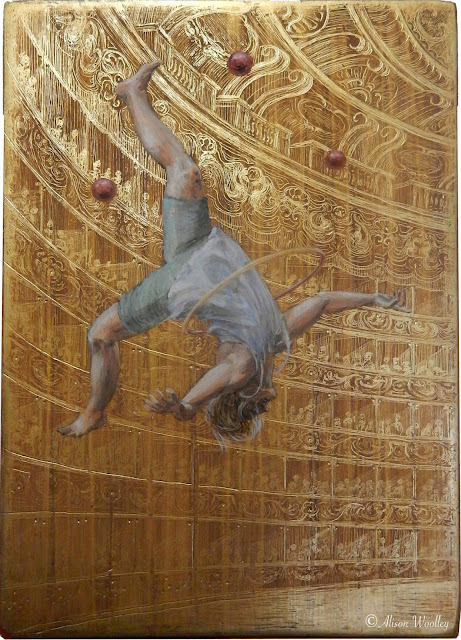 Her teaching studio is world-famous, drawing students and commissions from 5 different continents. Living and working in Florence for 30 years has given Alison a life full of inspiration. It's not just the old city, rich with historic artwork, architecture, and decoration, but the natural beauty of Tuscany, which has inspired its artists for centuries, and helped to create a environment that celebrates a high level of artisanship in every aspect of life, from art and architecture to fashion and food. "I have been collecting photos of simple grates that I see around here. I love the idea of a craftsman who has the task of making a practical grate, 500 years ago or 40 years ago, and puts that extra thought into it to make it aesthetically pleasing. " Among the traditions of Florentine art is the fondo oro - the ornamented gold fields seen in the Gothic and Early Renaissiance work of the 13-15th centuries by artists such as Duccio, Giotto, and Domenico Veneziano, which relates directly to the Byzantine work of the 11th-12th centuries. 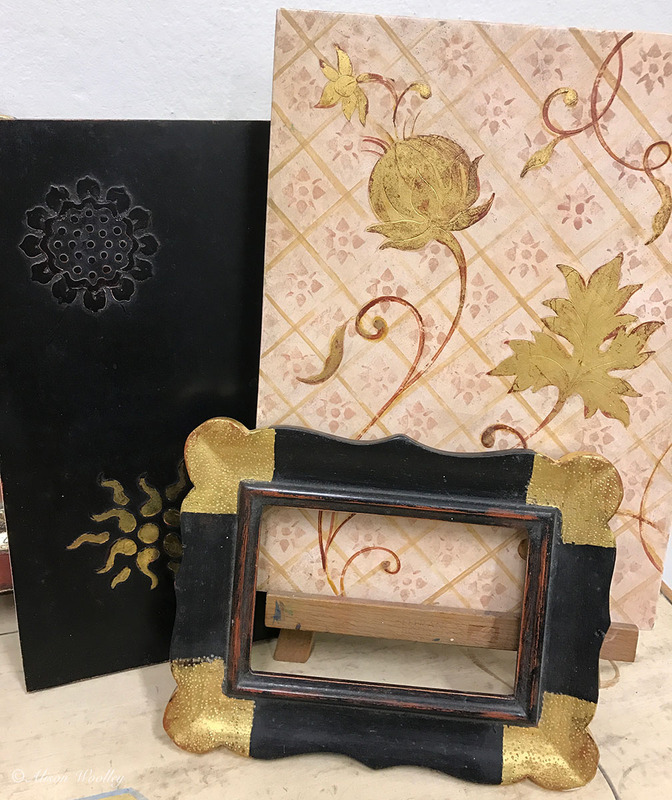 Gilt gesso panels embossed with patterns and incised with designs celebrate the rich gold surface and serve as the support of a painted figure or scene. These same historic techniques are beautifully integrated into Alison Woolley's decorative commissions as well as her fine art work.